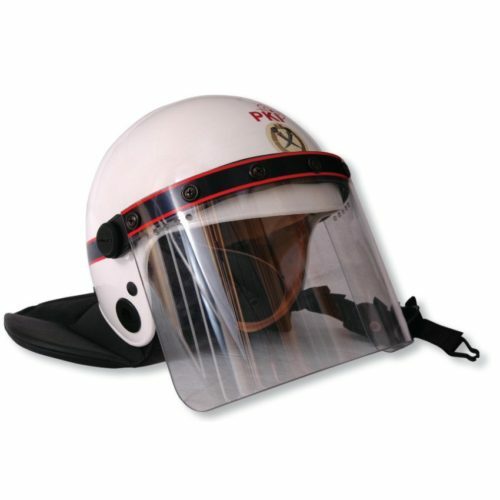 The PKI 9200 Protective Police Helmet is specially designed, according to DIN ISO 9001- norm, for any police and anti-riot squads. By using high impact strength compound, colour white, with ventilation holes for the helmet-shell and crystal-clear polycarbonate of 4mm thickness for the visor, this helmet provides a maximum of protection, but still is lightweight and most comfortable for wearing even under tropical conditions. Each helmet comes with a 3-section leather neckprotection. The detachable innerlining, individually adjustable to headsizes, offers highest shock-damping and together with the 3-point chinstrap perfectly matches for optimised fit. Additionally PKI 9200 can be supplied with specific governmental insignias of non-detachable, self-adhesive and multicoloured labels according to buyer’s requirements. Please contact us for further information. Inner lining special wearing-net with leather sweatband easily detachable without tools for size alignment.